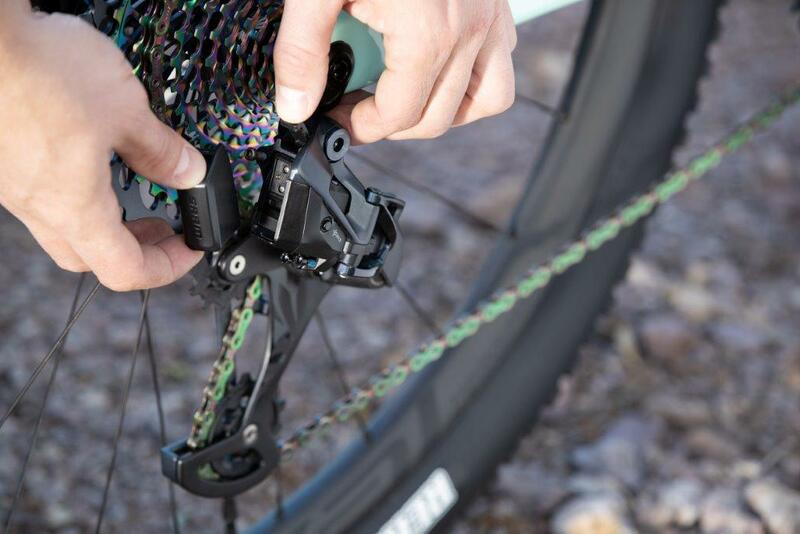 While it’s not the first electronic shifting system for the mountain bike (Shimano XTR Di2 was released in 2015), the Eagle AXS (pronounced ‘access’) is the first completely wireless system for the trail. The other big news is that the Eagle AXS system will offer the US-based component company’s first wireless control for its Reverb dropper seatpost incorporated into the shifter interface. The launch coincides with the release of SRAM’s RED eTap AXS system designed for road and gravel bikes. Interestingly, SRAM have got out ahead of the electronic cycling tech sceptics, stating that launching the Eagle AXS is for “riders’ sake”, not “tech’s sake”. SRAM said the system will start to reach retailers in the coming weeks, with the price expected to be around the £1,900 mark. The actual shifting system is unlike any we’ve seen before, with an innovative thumb-controlled rocker paddle to go up and down the gears or activate the dropper. One of the issues holding back digital systems in the past has been battery life, but SRAM have capitalised on recent advancements, offering interchangeable batteries with a 20-hour life span and an impressive one-hour charge time. The AXS system is built on the backbone of two upper tier SRAM Eagle groupsets, so you can choose to run it with either the X01 or XX1 drivetrain. Choice is a big part of SRAM’s ambitions for the system, with a bespoke Eagle AXS app which you can use to personalise how the system operates. It can also track how you ride, what gearing decisions you make, how many shifts you take, and a host of other data – but only if you want it to. While not directly related to performance, the Eagle AXS system also has a striking new look, with a rainbow colourway chain and XX1 cassette that will turn heads on any trail. The lack of cable, housing or wiring is the first thing that strikes you about the system. SRAM’s ‘ergonomic touchpoints’ are totally customisable, allowing you to choose which button does what through the AXS app. You can assign inboard shift, outboard shift or Reverb dropper control to any of the paddle’s switches. A useful power save function also kicks-in when dormant, and wakes up after a single touch, saving you battery power. Not that it’s really needed. The switcher runs on a typical CR2032 watch battery, which SRAM says will last around two years. One intriguing feature is the ‘Secret Sprint Paddle’ (pictured above), which sits beyond the controller’s standard paddle on the front-side of the controller near your index knuckle. This allows for quick shifts without changing your grip on the handlebar – handy! According to SRAM, the Eagle AXS derailleur is the brain of the whole system. It features a shorter cage for 10mm more ground clearance, with more chain wrap on the cassette to sit slightly further forward, and further inboard from mechanical Eagle. One major feature is the double clutch set-up; firstly an ‘Overload’ clutch system protects the mech from damage, allowing it to absorb impacts before returning to its original position. The second is a Type-3 roller bearing clutch, which enables instantaneous shifts while under load. On the top left of the above image, you can see the 25g battery, which pops out in a click and offers 20 hours of ride time. A smart move by SRAM is to make it ‘hot swappable’, so you can rip it out of the derailleur and stick it in the Reverb AXS seatpost, or even your SRAM RED or Force eTap AXS road group. Plus, and quite amazingly, it only takes an hour to charge. That cross-compatibility extends throughout the groupset, meaning you can use RED eTap AXS road switchers with the Eagle AXS derailleur – perfect for gravel bike riders and cyclocross. The derailleur is also fitted with a handy battery checker, which shines green, red, or flashes for low battery life when you push a button. The AXS app allows you to program and personalise how the system operates, like assigning different shift commands or dropper controls to either of the paddles so it suits how you ride. Link it to your SRAMid (although SRAM emphasise you don’t have to do this) and you’ll get service updates and ride data, such as shifting frequency and time spent on which sprocket. Aftermarket complete group sets will come equipped with a 32T chainring on X01 Eagle AXS and a 34T chainring on XX1 Eagle AXS. Aftermarket Eagle chainrings will be available in 30T, 32T, 34T, 36T, 38T. The wireless-electronic Reverb AXS is completely revamped and controlled using the paddle shifters instead of a lever. It can be infinitely adjusted and customised using the AXS app and because there are no external cables, hoses, or internal routing, it should be ridiculously fast and easy to install. It features a battery at the back (offering 40-hours ride time) that’s interchangeable with that of the derailleur, and it’s compatible with the RED eTap AXS, so it can be used with drop bar bikes too. What do you think of the new system? Let us know in the comments below.